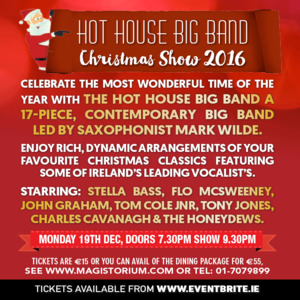 Celebrate the most wonderful time of the year with The Hot House Big Band a 17-piece, contemporary big band led by saxophonist Mark Wilde. Enjoy Rich, dynamic arrangements of your favourite Christmas classics featuring some of Ireland's leading vocalist's including Stella Bass, Flo McSweeney, John Graham, Tom Cole Jnr, Tony Jones, Charles Cavanagh and the Honeydews.Listen to this glistening orchestra perform many Yuletide favourites made famous by artists such as Michael Buble, Frank Sinatra and Ella Fitzgerald to name a few.Guests can get the full Big Band Christmas experience on Monday 19th December with doors open from 7.30pm show starts 9.30pm. Tickets are €15 or you can avail of the dining package for €55, which includes a Three course a la Carte menu plus the show.Tickets available here or from www.magistorium.com or Tel 01-7079899.